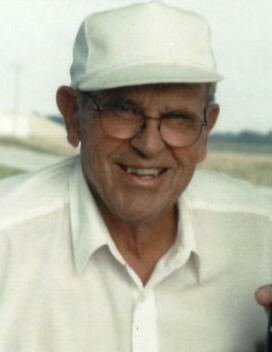 Richard Tubaugh, age 91, of Moravia, Iowa, passed away at his home of nearly 70 years on Wednesday, January 16, 2019 at 10:22AM. Richard was born on March 26, 1927 at home in Monroe County, near Blakesburg, Iowa, the son of Albert Otto and Irma (McCoy) Tubaugh. He was united in marriage to Venetah Pearl Andrews on May 1, 1949 at the Nazarene Church in Keokuk, Iowa, by Rev. Warren Byrd. To this union, two children were born, Janiece and Jaren. Richard never attended high school, but he earned his GED when he was 50. He worked with his brothers farming and livestock auctions for 40 years. He loved farming, and was proud to be the first to raise trefoil in Appanoose County. He and his brothers were also involved in the building of Lake Sundown. Richard enjoyed working with Little League and Babe Ruth Baseball teams. He was a member of the Moravia Grace United Methodist Church for 51 years and has attended the Moravia Lighthouse of the Nazarene since 2002. He enjoyed spending time with his family, especially his grandchildren and great grandchildren. Left to honor Richard’s memory are his wife of almost 70 years, Venetah Tubaugh of Moravia; his children, Janiece (Bob) Self of Moravia, and Jaren (Jamie) Tubaugh of Centerville; his grandchildren, Tava (Eric) Hoffman, Kelli (Brad) Morrow, Emily (Andy) DeJong, Brennen (Lisa) Tubaugh, Brody (Maddie) Tubaugh, and Molly (Andrew) Felton; his great grandchildren, Keith, Gracie, and Gus Hoffman, Josey and Jason Morrow, Declan, Leah, and Avery DeJong, Bowen, Isla, Anna, and Emma Tubaugh, Jaren and Teelie Tubaugh, and Bentley and Brantley Felton; sisters in law, Lorene Tubaugh of Moravia, and Billie Tubaugh of Belle Plaine, Iowa; as well as several nieces and nephews. Richard was preceded in death by his parents, Albert and Irma Tubaugh; his brothers, Ralph, Russell, Ray and Roy Tubaugh; and two sisters in law, Cora and Marie Tubaugh. Funeral services will be held at 10:00AM on Monday, January 21, 2019 at the Lighthouse Church of the Nazarene in Moravia with Reverend Terry Chapman and Reverend Brody Tubaugh, Pastor Christy Ehrle, and Reverend Jim Woodin officiating. Burial will follow the service at Hillcrest Cemetery in Moravia. A Visitation will take place, Sunday, January 20, 2019 at the Lighthouse Church of the Nazarene, with the family greeting friends from 2:00-5:00PM. Memorials have been established to the Appanoose County Little League, and may be mailed to Lange Funeral Home and Crematory, 1900 South 18th Street, Centerville, Iowa 52544. Condolences may be shared online at www.langefh.com.